FEBRUARY WARMTH CONTINUES THROUGH MIDWEEK: Temperatures are generally in the low 70s across Alabama this afternoon; the sky is mostly cloudy over the western counties at mid-afternoon, with a partly sunny sky to the east. There is very little on radar. Tonight will be mostly cloudy with a few isolated showers possible; temperatures won’t drop below the low 60s. WEDNESDAY/THURSDAY: Not much change Wednesday — more clouds than sun, a few scattered showers and a high in the low 70s for most communities. Thursday looks mostly dry during the day with a mix of sun and clouds. For now we are forecasting a high of 75 degrees, within one degree of the record high of 76 for Feb. 7, set in 1999. Showers will likely move through the state Thursday night ahead of a cold front. COLDER FRIDAY: Friday will be a different kind of day with a much colder air mass dropping into the state. Look for breezy, cold and lingering clouds most of the day. Temperatures will hold in the 40s over the northern counties with a cool north breeze. Some partial clearing is possible Friday afternoon. Friday night will be cold; we project a low in the mid 20s by early Saturday morning as the sky becomes clear and the wind dies down. 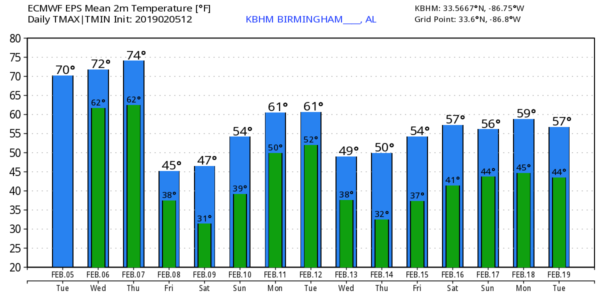 THE ALABAMA WEEKEND: Saturday will be a sunny day with a high near 50, and we have removed the chance of showers Sunday. The day will be partly sunny with a high between 56 and 60 degrees. NEXT WEEK: Most of the week looks cloudy and mild with some risk of showers daily and highs mostly in the 60s. On a positive note, we see no risk of severe storms, tornadoes, flooding, snow or ice across Alabama for the next seven to 10 days.